It also features a three-level safety protection system: auto shut-off when the water boils, thermal cut-off and auto shut-off when the kettle body is lifted from its base. With non-slip feet, cord storage and twin neon power-on lights, the KBJ3001.W will be as attractive in your kitchen workspace as it is safe and easy to use and with matching toaster available, will give you that wow factor when you invite guests into your kitchen. Inspired by the crystal artwork of Varisco, the Delonghi KBJ3001.B Black Brillante kettle is a stunning addition to any kitchen. It also features a three-level safety protection system: auto shut-off when the water boils, thermal cut-off and auto shut-off when the kettle body is lifted from its base. De'Longhi KBJ3001.BK Brillante KBJ3001BK Kettle. 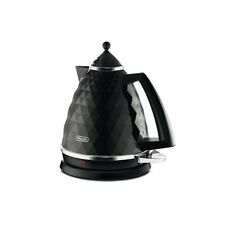 De'Longhi Brillante Faceted Jug Kettle, 3 KW - Black. 1 x De'Longhi Brillante Black Jug Kettle. The refurbished (factory second) product has been through a complete factory testing, refurbishing and hygienic process. The extra lift makes it easier to get toast out if needed. The deep crumb tray will keep your kitchen surface tidy. Boil dry protection - automatically switches off when the kettle is empty. Rapid boil. DeLonghi 'Brillante' KBJ3001.BK kettle…. condition - odd mark/light scratch. otherwise, good working order! 1 x De'Longhi Brillante KBJ3001.BK Black Jug Kettle. It features a three-level safety protection system: auto shut-off when the water boils, thermal cut-off and auto shut-off when the kettle body is lifted from its base. De'Longhi Brillante Faceted Jug Kettle, 3 KW - White. 1 x De'Longhi Brillante KBJ3001.W White Jug Kettle. De'Longhi KBJ3001.W Brillante Faceted Jug Kettle. It also features a three-level safety protection system: auto shut-off when the water boils, thermal cut-off and auto shut-off when the kettle body is lifted from its base. Delonghi Kbj3001.Bk Black Brillante Kettle New!!! Delonghi Brillante Kettle - Jet Black. With its unique looks, the De’Longhi KBJ3001.BK Brillante cordless jug kettle in black makes a great addition to any modern kitchen. Featuring a 360-degree swivel base, this jug kettle is ideal for left- and right-handed users. DeLonghi Brillante/brilliante KBJ3001.BK 1.7L kettle lid/top,black,kettle part..
Wicklow - De'Longhi Brillante Faceted Jug Kettle KBJ3001.W, 3 KW - White. 1 x De'Longhi Brillante KBJ3001.W White Jug Kettle. It also features a three-level safety protection system: auto shut-off when the water boils, thermal cut-off and auto shut-off when the kettle body is lifted from its base. The extra lift makes it easier to get toast out if needed. The deep crumb tray will keep your kitchen surface tidy. Boil dry protection - automatically switches off when the kettle is empty. Pull off lid. 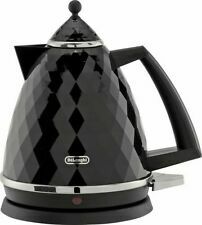 De'Longhi Brillante Faceted Jug Kettle, 3 KW - Black. 1 x De'Longhi Brillante Black Jug Kettle. 1 x Fitted UK plug. Box Contains. Product Features. 3 kW power and 1.7 L water capacity. 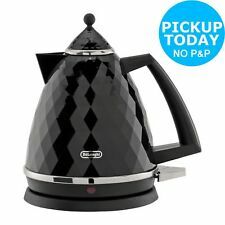 Wicklow - De'Longhi Brillante Faceted Jug Kettle, 3 Kilowatt - Black. 1 x De'Longhi Brillante KBJ3001.BK Black Jug Kettle. Inspired by the crystal artwork of Varisco, the Delonghi KBJ3001.B Black Brillante kettle is a stunning addition to any kitchen. De'Longhi Brillante Faceted Jug Kettle, 3 KW - White. 1 x De'Longhi Brillante KBJ3001.W White Jug Kettle. 1 x Fitted UK plug. Box Contains. 3-level safety protection: auto shut-off when boiled or lifted and thermal cut-off. The extra lift makes it easier to get toast out if needed. The deep crumb tray will keep your kitchen surface tidy. Boil dry protection - automatically switches off when the kettle is empty. Complete with 360 degree swivel base for easy use, water level indicator for just the right amount and auto shut off. Boil dry protection - automatically switches off when the kettle is empty. Pull off lid. This collection occupies a new status in your kitchen décor – the unique multi-faceted surface reflects light, and it’s ultra-durable. Presented in a DeLonghi box. Black Brillante Kettle features The Brilliante Kettle is not just a kettle, it’s a work of art. The Delonghi KBJ3001.W Cordless Jug Kettle has a stylish and modern design that will look great in any kitchen! With 3 levels of safety protection the KBJ3001.W will automatically shut off when the water boils there is a thermal cut off and the kettle shuts off when lifted from the base giving you peace of mind. This collection occupies a new status in your kitchen décor – the unique multi-faceted surface reflects light, and it’s ultra-durable. Presented in a DeLonghi box. White Brillante Kettle features The Brilliante Kettle is not just a kettle, it’s a work of art. Complete with 360 degree swivel base for easy use, water level indicator for just the right amount and auto shut off. Boil dry protection - automatically switches off when the kettle is empty. Rapid boil. Complete with 360 degree swivel base for easy use, water level indicator for just the right amount and auto shut off. Boil dry protection - automatically switches off when the kettle is empty. 360 degree base. Three level safety protection: Auto shut-off when boiled or lifted and thermal cut-off. The rapid boil function is convenient for making beverages quickly and the water level indicator is handy for boiling just the right amount. Boil dry protection - automatically switches off when the kettle is empty. De'Longhi Brillante Faceted Jug Kettle, 3 KW - Black. Inspired by the crystal artwork of Varisco, the Delonghi KBJ3001.B Black Brillante kettle is a stunning addition to any kitchen! NP Functionality of the Brillante Kettle is of course in keeping with Delonghi's high standards, with a 360 degree swivel base for both left- and right-handed use, cord storage and a maximum water capacity of 1.7 litres. Complete with 360 degree swivel base for easy use, water level indicator for just the right amount and auto shut off. Boil dry protection - automatically switches off when the kettle is empty. We go above and beyond to ensure you receive the best level of service. The extra lift makes it easier to get toast out if needed. The deep crumb tray will keep your kitchen surface tidy. Boil dry protection - automatically switches off when the kettle is empty. We go above and beyond to ensure you receive the best level of service. Wicklow - DELONGHI BRILLANTE CTJ 4003. 1 x DELONGHI BRILLANTE CTJ 4003. BK 1 Year Manufacturer’s Warranty. Reheat function: ✓. Defrost function: ✓. Crumb tray: 2. Choose your favourite colour: Black. The Delonghi KBJ3001.W Cordless Jug Kettle has a stylish and modern design that will look great in any kitchen! Inspired by the crystal artwork of Varisco, the Delonghi CTJ4003.B Black Brillante 4 Slice Toaster is a stunning addition to any kitchen! NP Functionality of the Brillante Toaster is of course in keeping with Delonghi's high standards, it has 1.8 kW of power for rapid toasting and even although it's designed to toast four slices, this toaster can also operate two slots independently, allowing you to make two slices of toast without wasting energy. Every house needs this chic kitchen accessory. This black KBJ3001 kettle from Delonghi features a contemporary textured cut and black heat proof handle and lid. 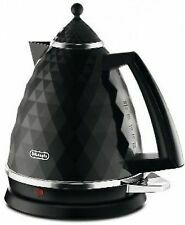 DeLonghi - Black 'Brillante' kettle KBJ3001.BK. Inspired by the crystal artwork of Varisco, the Delonghi KBJ3001.W White Brillante kettle is a stunning addition to any kitchen. Looking for a matching colour microwave, kettle toaster set or other matching colour appliances for your kitchen?. De'Longhi Brillante Faceted Jug Kettle, 3 KW - White. 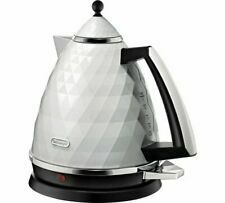 1 x De'Longhi Brillante KBJ3001.W White Jug Kettle. Box Contains. We're happy to help. Add to Favorite. We do not accept P.O. Boxes.